When I took over as Editor, I want to go to all the Tandem Wing fly-ins if I could. I want to go to Livermore especially to see the largest concentration of Q's at any one airport. Personally it was a great trip as I stayed with my old college roommate. If you get a chance guys, this is a great event to go to. The best thing about going to the Livermore fly-in had nothing to do with the aircraft that were there. The best thing about Livermore was seeing someone I had met at AirVenture not more than 3 weeks earlier. It was great to see Phil Lankford! We came close to losing Phil and his wife Cheri when they had a prop failure while returning from Oshkosh. (Phil tells his story later in the Newsletter) He had left me a voice mail three days earlier to say he and Cheri would be OK, but to see him in the flesh and shake his hand was the thing I took away from Livermore. He really is OK. His humor is still intact and he has a new perspective of his fine aircraft which is now a pile of foam and fiberglass. All the while he was at AirVenture he worried about the finger print smudges. Those smudges look pretty irrelevant now. What a great place the Livermore airport is. Over 500 aircraft are based here. During the daylight hours you can see small aircraft of all kinds either waiting to take off or coming in for a landing. It's true we don't get to do the wide open flying at this event like we do in the Midwest, but there are no less than 6 Q-birds at this airport. It is the current mecca for Quickie type aircraft. I personally liked the fact that there was a golf course adjacent to the airport grounds. We had ten tandem wing aircraft and nine were Q's. 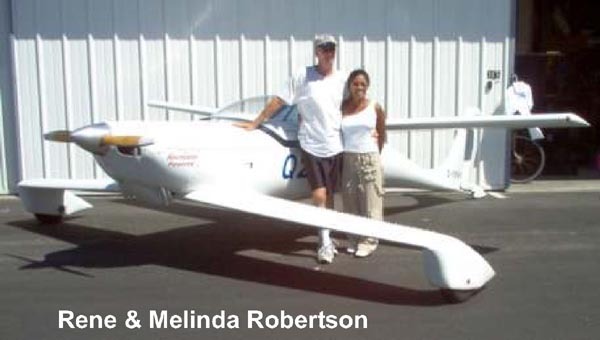 Rene and Melinda Robertson in their RevMaster Q2 from Alberta Canada, Mark Robinson in his Tri-Q, and Tim Iverson in a Dragonfly from southern California, were the only ones to actually "fly in" to Livermore. A forum by Paul Lipps, a retired Aerospace electrical engineer was one of the highlights on Saturday. Paul designed the electronics for the Lightspeed electronic ignition for Klaus Savier. He came to Livermore sporting a very unique looking prop. His test aircraft is a Lancair 235. 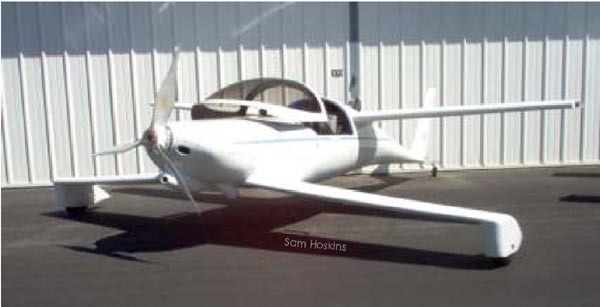 He designed his prop using software of his own, based on the idea that the lift distribution on the prop ought to be elliptical, since that is considered to be optimum on a wing. 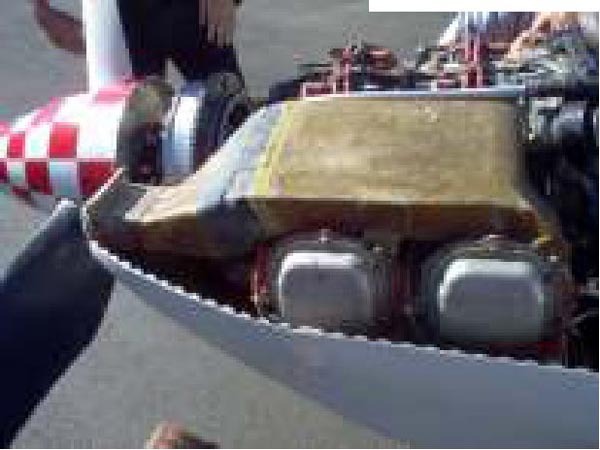 His prop powered the Phantom racing biplane to a convincing win at last year's Reno Air Races. 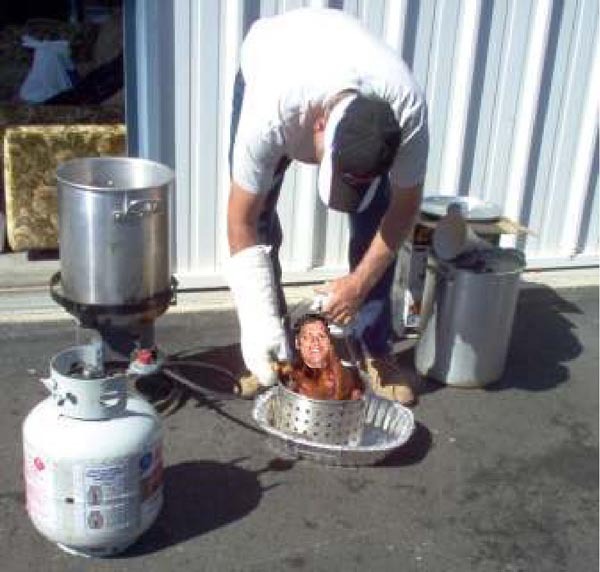 Another highlight was the deep fried turkey with Jim Patillo's special seasoning. It was cooked on site and it was delicious. Hi All, I sure am glad I attended the fly-in. It was good to see you all again. Good to see Phil up and around after his mishap. Sorry I did not get to stay and enjoy the great food fest but needed to get to Tahoe so I could at least have Sunday to work on mine. As usual, I did learn plenty and everyone was so kind to open their cowls for us all to see. I took in excess of 50 pictures. It was a real treat for me to get to look under Paul Lipp's cowl and he was so kind to explain everything he has done. It was good to see someone depart from the norm for something that works better. So many of us just use the same old parts and systems; I really enjoy experimenting with all the new ideas and products. Since I am in the middle of building the plenum on my 0200, it was perfect timing to see how Paul did his. I just have to add the inserts to direct the air on the top like Paul has his. Also, I will direct air to my Megalight coil, which is mounted on top of the crankcase, in a similar fashion as Paul has. The bottom of the plenums were the best part. I have been racking my pea brain on how to do it. 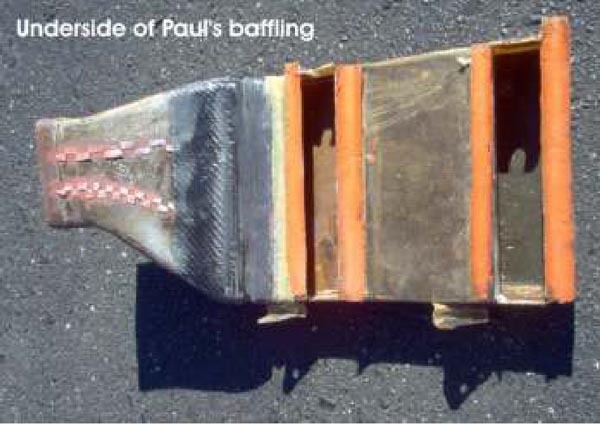 I will proceed with the bottom plenum very similar to what Paul has. Just think, I won't need all that exhaust pipe. And I just had them ceramic coated for $100.00. Oh well! Melinda and I made it back home last night in C-FBWV after a terrific time in the Bay area! Wow, we had a blast at the LVK fly-in. I cannot thank the guys and gals at LVK enough for putting on such a fun event. Special honors go to Bob and Jim for all of their hospitality and hard work. We really enjoyed meeting everyone and putting a lot of faces to names I see often on our list. You guys are a great bunch! I'm still on a high after chatting with everyone on Friday night and all day Saturday. Jim cooked up a turkey that was just unbelievable. Marinated in his special blend of secret stuff and deep fried in peanut oil. I have never seen so many Quickies and a Dragonfly together in living color. We left LVK on Sunday for Reid Hillview to visit with relatives in San Jose. On Wednesday morning we took off at 11:00 am for Half Moon Bay for some of the crab Jim had recommended. San Jose Int'l. Tower directed us straight across midfield. As soon as we crossed the little ridge of mountians by the coast we were above a solid layer of overcast marine layer at 2500'. We decided to carry onto Half Moon Bay, but couldn't land due to the cloud cover. In fact, if it wasn't for the GPS, I had no idea where we were. We told San Jose that we would carry on to the Golden Gate Bridge. Once there I could just make out the Bridge below and Alcatraz was clear. So, we slipped down through a hole and flew over the Bridge at 1200', circled Alcatraz a couple of times and took lots of pictures of Frisco. What a blast! After that we carried onto Redding and homeward bound. Thanks again to everyone for making our stay one to remember for a lifetime. I highly recommend that anyone who hasn't yet attended this fly-in to do so next year!